How do users interpret and interact with your product pages? At Baymard Institute we’ve spent more than 2 years only testing Product Page UX, testing how users interpret and interact with product pages on e-commerce site, and what product page layouts, designs, content types, and features that perform the best. Nearly all users go through a product page before making any purchase, and it’s often on the product page where users make up their mind on whether or not they want to purchase the item. This makes the product page the centerpiece of your users’ e-commerce experience. Yet at the same time, the product page layout and features tend to be under a lot of strain as they often rely on the same template re-used across the entire site’s product catalog. This page provides you an overview of our research specific to Product Details Page UX. 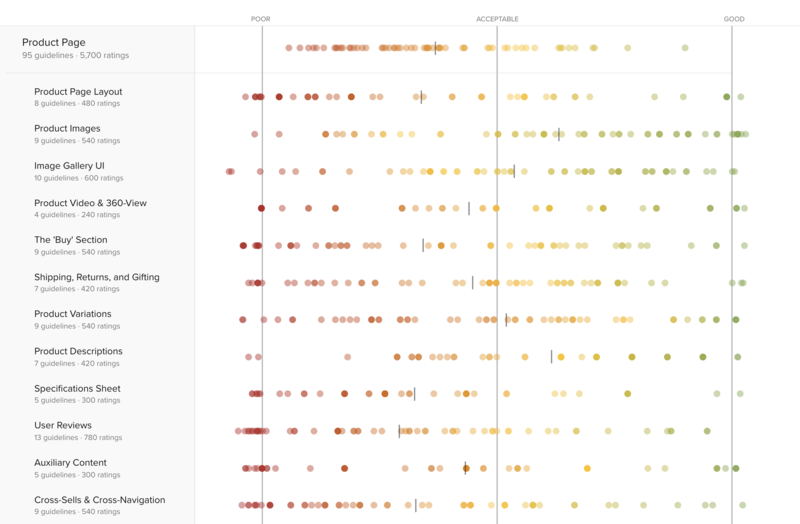 Our Product Page UX benchmark database contains 5,880 product page site elements that have been manually reviewed and scored by Baymard’s team of UX researchers, with an additional 4,100 best- and worst-practice examples from the top-grossing e-commerce sites in the US and Europe. However, the Product Page UX performance benchmark database reveal that the average site has 24 structural UX issues on its product pages, and only 18% of the 60 top-grossing US and European e-commerce sites have a “good” or “acceptable” product page UX performance. The vast majority of benchmarked sites — 82% — have a “poor” or “mediocre” performance. And no sites have a “state of the art” product page UX performance. 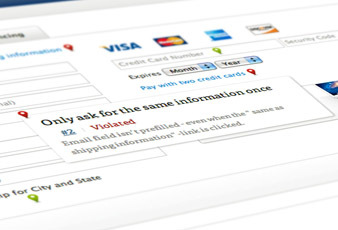 Within their product page implementation the vast majority of e-commerce sites have multiple severe usability issues with their Specifications Sheet, Shipping & Returns, User Reviews, The ‘Buy’ Section, and Cross-Sells & Cross-Navigation – which combined cause much of the overall substandard product page UX performance. Explore design patterns across 285 examples of product page designs and features from leading e-commerce sites, all annotated and organized into 5 different categories. This is a great way to get inspiration for your own product page design, and to get a feel for emerging trends in e-commerce product pages. The 4 predominant Product Details Page layouts used in e-commerce: ‘Horizontal Tabs’, ‘Sticky TOCs’, ‘Collapsed Sections’, ‘One Long Page’, how they each perform, and which layout to generally avoid. How users rely on images on the product page, the 7 different product image types users generally need, the amount of images needed, and how large sites can approach some of the image sourcing. How to design a high-performing imagery gallery that serves as the perfect container for the product images, incl. image navigation, how to zoom images, overlays, default image size, etc. ‘Rich visuals’ like product video and 360-views, how users utilize it, and the features each of these need in order for users to be able to reliably control the content. The design and position of elements such as the ‘Add to Cart’ button, prices & discounts, the quantity field, ‘Out of Stock’, ‘Save to List’, etc. The best-performing designs for displaying shipping and return info at the product page, the amount of info required, along with how to best present “Free Shipping”, handle gifting, and “Find in Store” features. The selection interface for color and size variations, reusing content across variations, size guides, along with the interfaces required for both product customizations and personalizations. How users engage with and rely on product information and descriptions, the type of content needed, product headlines sub-titles, along with both the text structure and styling that performs the best. How users engage with spec sheets, and how both the spec sheet layout, spec sheet features, and post-processing of vendor data are critical for making users less prone to users misread the specs. The user review submission form, review filtering, sorting & navigation, rating distribution summaries, and more. A variety of auxiliary content types found on e-commerce product pages, such as Q&A, FAQs, product manuals, social media tools, and expert-generated content. Cross-sells and cross-navigation and users’ overall success at locating their desired products, incl. 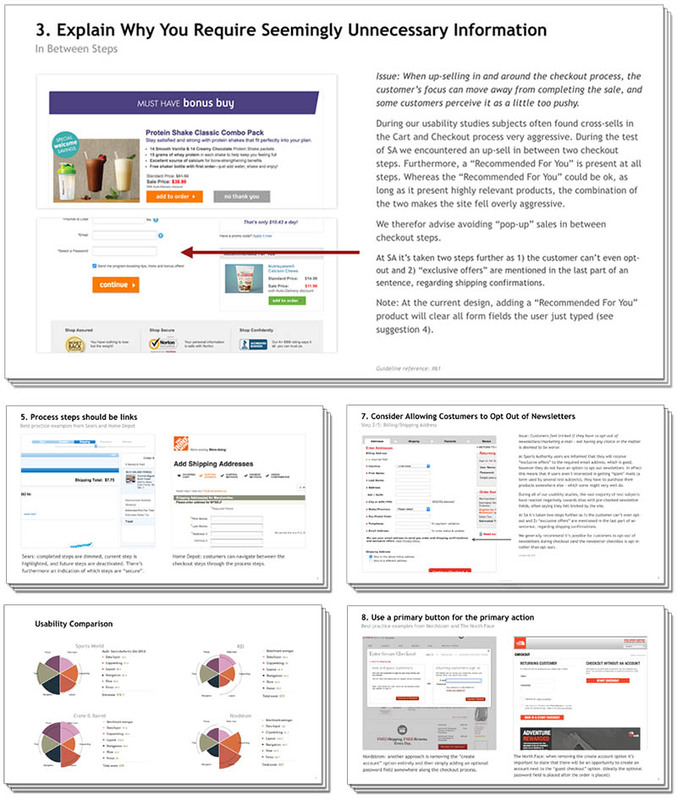 cross-sell design, placement, and logic, and cross-navigation elements such as ‘Recently Viewed’, parent links, etc. What are the 15 most important changes you can make to your e-commerce product page design and features? 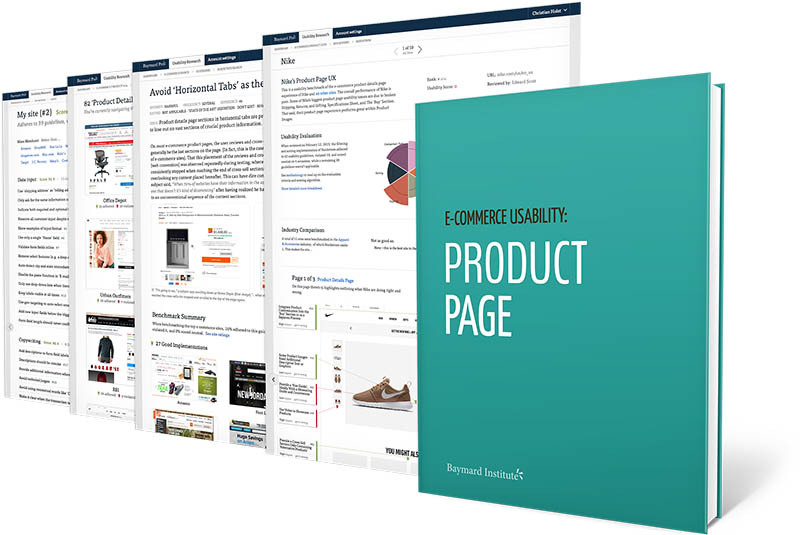 We will put together a detailed 40-page report of the 15 most important usability improvements you can make to your product page implementation. This research study on Product Page UX is part of Baymard Institute’s full 37,000 hours of large scale research catalog. The full Baymard research methodology is described in detail here.